Alexandra Christodimou and Yannis Petridis, studied at the National Conservatoire of Athens with the famous guitar duo Evangelos Assimakopoulos and Liza Zoe and graduated, honored with distinction. They carried on their studies at the Royal Northern College of Music, Manchester, UK, taking a postgraduate degree in musical performance with Gordon Crosskey. In addition, Yannis Petridis holds a Doctorate degree from Stony Brook University, New York, USA, where he studied with full scholarship under Professor Jerry Willard. They are both awarded at Greek and International Guitar Competitions. They have performed as a duo in major concert halls, guitar festivals, Colleges and Universities - including Yale University, and taught in Master Classes, in USA, Canada, G. Britain, Germany, France, Cyprus, Hungary, Morocco and of course Greece and have broadcast and performed for various Broadcasting Organizations and collaborated with orchestras. They have toured extensively with the Cyprus State Orchestra and have performed at the Athens Music Hall, the Greek Presidential Palace and for the Greek Composers Union. Among their interests, throughout their career, has been to enrich the guitar duo repertoire by transcribing for two guitars works such as G. Gershwin's “Rhapsody in blue” , J. S. Bach's “Italian Concerto”, J. Rodrigo’s ‘Adagio” from the ‘Concerto d’ Aranjuez’ as well as to give out Greek music: works by Greek composers are always performed in their concerts, some of which are dedicated to them. Recently, Yannis Petridis gave a lecture at Yale University illuminating the topic: “Ancient, traditional, popular and modern Greek traces in the music for two guitars by T. Antoniou, P. Koukos, K. Giorginakis, K. Grigoreas, V. Tenidis”. It is worth mentioning their arrangement of Manos Hadjidakis' "For a little white seashell” - a milestone in Modern Greek music - which is included in the CD “Master Class, Half a Century of Greek Guitarists”. Last fall, they toured USA and Canada presenting works by Greek composers, some dedicated to them, on a series of concerts under the title “Four Greek composers meet George Gershwin” - with the addition of the iconic “Rhapsody in Blue”. As part of their collaboration with the historic recording label LYRA, they have released the CDs "Rhapsody for two guitars" including works by G. Gershwin, J. Rodrigo, A. Piazzolla, J. S. Bach, K. Giorginakis and "Mediterranean Echoes" with works by L. Boccherini, J. Rodrigo, M. de Falla, M. Gangi, P. Petit, and K. Grigoreas. Yannis Petridis recently has released the CD “Late 20th Century Music for Guitar” based on music by A. Ginastera, L. Berio, E. Carter και B. Britten (MOTIVO 2016). Their CDs have been received with very complimentary comments and excellent critiques by Greek and International Press. 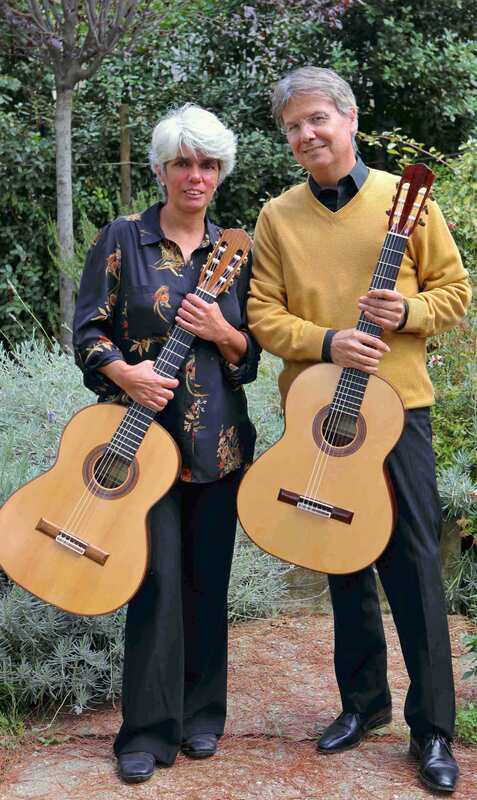 Their repertoire includes, among others, music for two guitars by Bach, Lawes, Telleman, Scarlatti, Giuliani, Sor, Carulli, Boccherini, Debussy, Granados, De Falla, Tedesco, Petit, Milhaud, Jolivet, Brouwer, Dyens, Ohana, Bons, Cordero, Rodrigo, Gershwin, Piazzolla, Gnatalli, Biberian, Gangi, Morel and music by Greek composers such as Hadjidakis, Antoniou, Koukos, Konstantinidis, Tenidis, Giorginakis, Boudounis and Grigoreas, some of which dedicated to them. With their interpretation, Alexandra and Yannis have gained very flattering comments by important personalities of the Greek and International Guitar World. Today, Yannis, after working as teaching assistant at Stony Brook University, USA, teaches at the American College of Greece and both Alexandra and Yannis teach at the National Conservatoire of Athens. Alexandra and Yannis are Associates of the Heritage & Museums, Art, Culture and Education around the world. Since 2011, they are the artistic directors of the Palaio Faliro Guitar Festival in Athens, Greece.